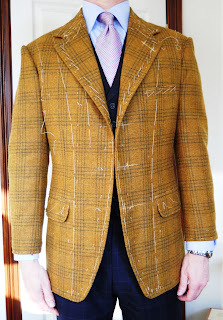 Just a further update on this JJ Minnis 7704 sports jacket, which is now ready for finishing. What happens to your jacket when it goes to the finisher?? 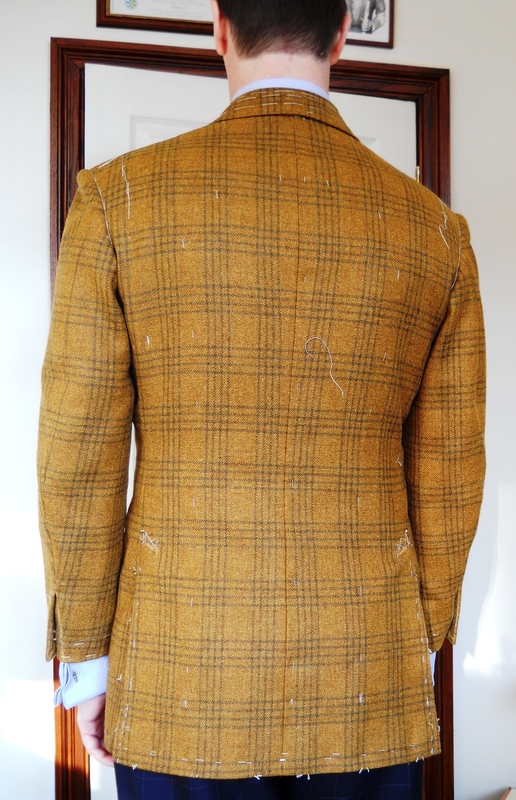 The edges of the jacket will all be stitched by hand and in this case with it being a tweed, we will use what is called a "swelled edge". Whereby it will be sewn approx 3/8" (1cm) in from the edge, unlike most suit jackets and blazers, which would be sewn virtually on the edge. In both cases the purpose of this stitch is to stop the edges rolling. 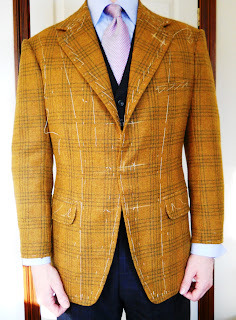 The "swelled edge" is mainly a distinguishing feature of tweed jackets, due to the thickness of the cloth but could be utilised as a style feature if required. 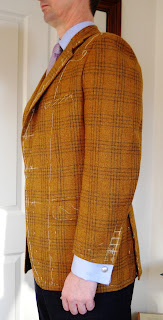 Along with the edge stitching, the buttonholes, felling of the lining and the undercollar will all be done by hand to prepare the jacket for pressing and buttoning, before delivery to the customer. Whilst making the jacket, the tailor should use a process called under pressing, which basically means pressing the job ( jacket) as you go, this will help and make the final press a lot easier. Please note that Dad (Edwin DeBoise) is modelling the jacket for the purpose of the article. Things You Do For Airmiles...NYC December Trip!